I spent part of an afternoon recently with my cousin Jim (aka Bobo) and his wife Donna in the home studio where she makes original fused glass art pieces, jewelry, bookmarks, window hangings, Christmas ornaments and just about anything else imaginable that can be made with glass. She had posted pictures on Facebook of art pieces/caricatures she had made of Bobo and his brother, Hazen, doing their favorite hobbies, golfing and fishing, respectively. I was so taken with them that I asked Donna if she could do one of me singing, and she said she’d give it a try. When she contacted me to let me know that my art piece was completed, we made a date for me to go over and pick it up. And when she unveiled it, I squealed with delight! We enjoyed a wonderful visit, someplace other than a funeral home, which is where we tend to run into each other these days. I looked around her studio and learned the story of how she got into working with glass. The colors, textures and shapes fascinated me as I poked in every corner of the space, and Donna explained that each piece is one of a kind because when it goes into the kiln for firing, she never knows exactly how it’s going to turn out. Colors and finishes change when they are fired. 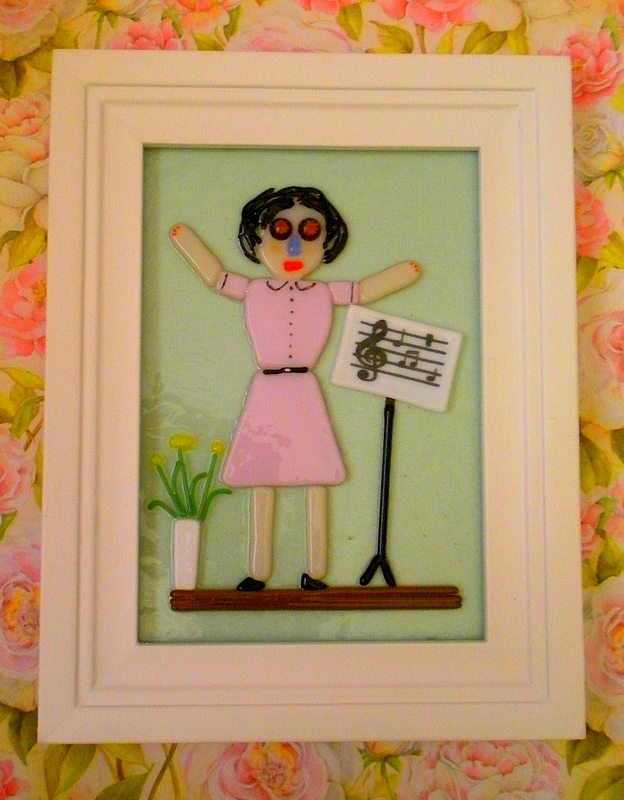 That element of surprise is part of the joy of fused glass work. Donna was a hairstylist for years before retiring and beginning this new creative chapter of her life. I commented that doing hair was an art form and she replied, “Well, it should be.” Her daughters are both creative as well, with enterprises and interests ranging from music to photography to embroidery. And they’ve passed that creativity to their children as well. It runs in the family just like brown eyes or blonde hair. 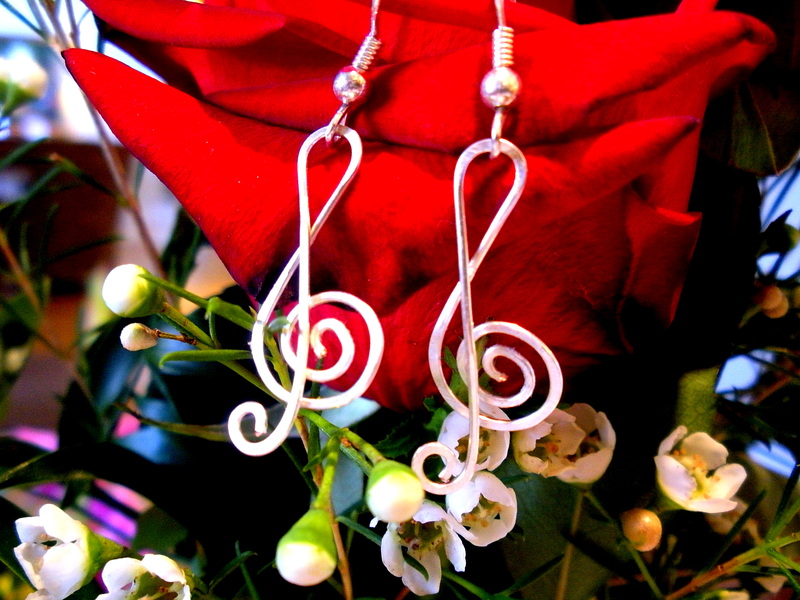 My friend Vicki recently sent me a surprise in the mail, a beautiful pair of handmade silver earrings shaped like treble clefs. She wrote in her card that she’d seen them where a lady was showing her handmade creations and they made her think of me. I’ve worn them numerous times since receiving them and people always comment on how beautiful and unusual they are. And with gratitude, I always share the story of how they came to me. 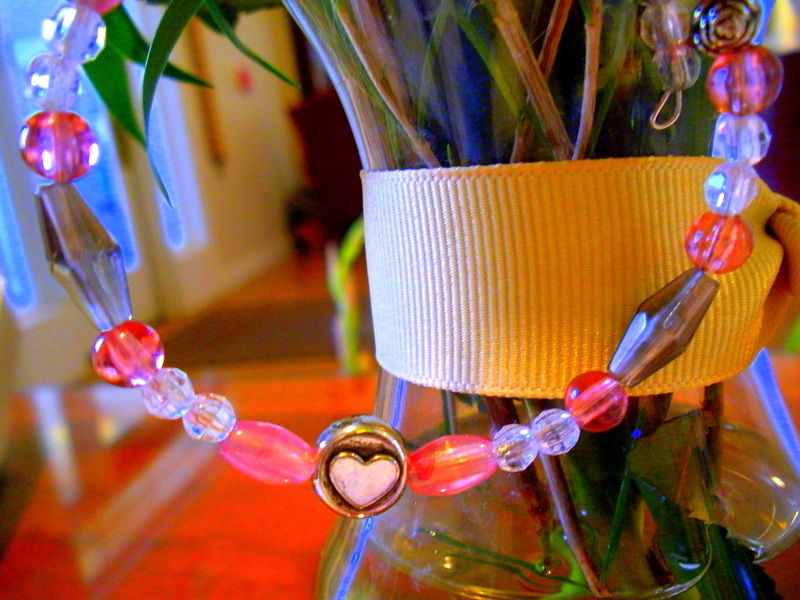 Several years ago, my friend Olivia, who was a member of the fraternity I serve as chapter mother, made me a bracelet in the fraternity colors, with a heart charm and my initial. It’s a treasured gift and a reminder of the gift of creativity that lives within her, and within all of us. I am primarily a musician, a singer. But I also write, make scrapbooks and greeting cards, and take pictures. My friend David told me years ago that all creative people have more than one outlet for expression, and I believe that is true. There are writers who also paint, painters who also dance, dancers who also quilt, quilters who also play instruments…the combinations are limitless. Genesis tells us that “In the beginning God created…”, (emphasis mine) and that He “made mankind in His image…”. It stands to reason, then, that we are all endowed by the Creator with the gift of our own creativity, in whatever ways it manifests itself. I count myself blessed to come from a heritage of so much music and creativity on both sides of my family. I may not express my creative instincts in all the same ways as my predecessors have, but I try to express myself to the best of my ability and in the ways that best suit me. And I continue to explore new ways to express those creative urges. God gave them to me to use, and I hope to use them to bless other people.